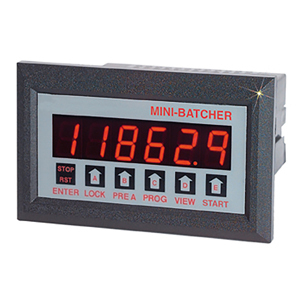 The DPF11 is a 6-digit totaliser and 4 1/2 digit ratemeter with two relay outputs. One output is dedicated to the Batch Amount (Preset A), the other can be activated for Prewarn or Batch/Grand Total. The unit can count up to the preset (reset to 0) or down from the preset (set to preset). Start, Stop and Reset functions can be activated from the front panel or remote inputs. Up to 99 units can communicate to a host computer on a single loop with the RS232 or RS422 communications options .